We have written a long document, and we want to refer to a specific line in our document such as a legal document. What do we do? Well we don’t start counting lines with our fingers, that’s for sure. 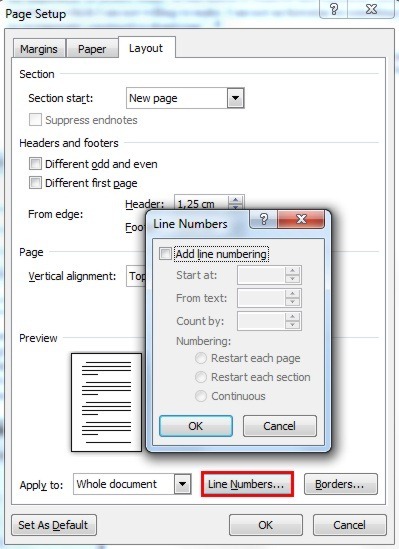 Thankfully with Microsoft Word we can count automatically the lines in our document and display the line numbering at the left of each line. In order to use the Line Numbers command we must select the Page Layout tab and then from the area of the ribbon named Page Setup we select the arrow at the right of the command Line Numbers in order for the drop down menu to appear as shown below. Continuous: By using this command the line numbering will be continuing as we type. Restart Each Page: By using this command the line numbering will continue until we reach the end of the page and then it restarts counting on the next page. 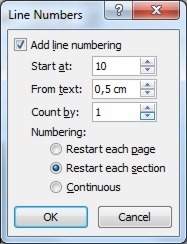 Restart Each Section: If we have divided our document into sections, the line counting will end the numbering at the end of one section and start again from the beginning at the next section. Suppress for Current Paragraph: By using this command the Line counting doesn’t count the current paragraph and continues counting the lines from the next paragraph. From the drop down menu of the Line Numbers command, if we select the command Line Numbering Options the Page Setup window appears with the Layout tab activated as shown in the image below. At the bottom of the window we must select the button Line Numbers as shown below in order for the Line Numbers window to appear. From the Line Numbers window we must activate the Add Line Numbering check box in order for the rest of commands to be activated. Once activated, we can define with which number the line counting will start, we can define the distance that the line numbering will have from our text. We can also define on how the line numbering will count the lines, for example by five (5). Finally we have the commands Restart Each Page, Restart Each Section, Continuous, the same commands that were found on the drop down menu of the Line Numbers commands on the Page Setup tab. We must keep in mind that Word numbers each line in a document except the ones in tables, footnotes, endnotes, text boxes, and headers and footers. Assuming that we have charts and objects in our spreadsheet and we come to the point that we are not satisfied with the appearance of them and we want to delete them all at once. What do we do? 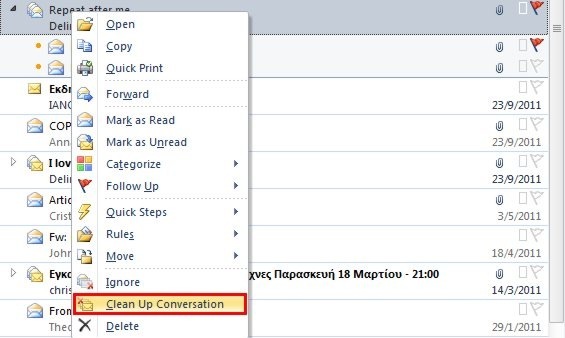 Instead of selecting them one by one (procedure which will take a long time) and then pressing the delete button every time, we can follow the next tip. 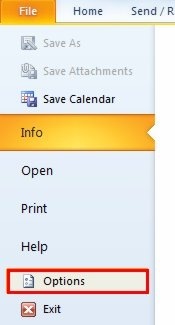 On the Home tab of the Excel window and in the area of the ribbon named Editing, we select the Find & Select button. From the drop down menu that appears we select the Go To Special… command as we can see in the image below. 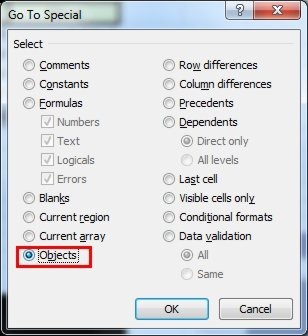 The Go To Special window appears, where we activate the button next to the command Objects as we can see in the image below and the press the OK button. Once we press the OK button, we will notice that all the objects in our spreadsheet are now selected. Now all we have to do is to press the delete button (seeing that, that is what we wanted) in order for all the objects to be deleted. Below you can check out the video describing on how to delete all the objects in our spreadsheet very quickly. Excel offers us some useful tools for auditing a formula, in order to understand what we have done wrong in the formula, by tracking down the relationships between the cells of the formula in a spreadsheet. By tracking the cells we will be able to locate the Precedents cells and the Dependents cells. What are Precedents and Dependents though? Precedents are cells or ranges of cells that affect the active cells value. Dependents are cells or ranges of cells that are affective by the active cell. In formulas that we create in Excel, they may contain precedents, and maybe they are dependents on other formulas. First of all we must select the cell that we want to trace the Precedents or the Dependents. Then we select the Formulas tab and then from the area of the ribbon named Formula Auditing we select either Trace Precedents or Trace Dependents as we can see in the image below. In the image below I have selected the J10 cell (which contains a formula) and then clicked on the Trace Precedents button once. Straight away the blue arrows appear showing what cells affect the value of the currently selected cell. In the image below I have clicked on the Trace Precedents button once more, and more blue arrows appear showing us which cells affect the value of the primary precedents cells. In the image below I have selected the cells C9, D9, E9, F9, G9 one by one and each time I selected one cell I also activated the Trace Dependents button. Once finished the blue arrows indicate what cells are affected by the value of the currently selected cells. If we double click on a blue arrow, that will activate the cell on one end of the line, and if we double click it again it will activate the cell on the other end. By using the Trace Precedents and Trace Dependents commands we will be able to understand our formula much better and if anything is wrong with it we will be able to locate the error also. 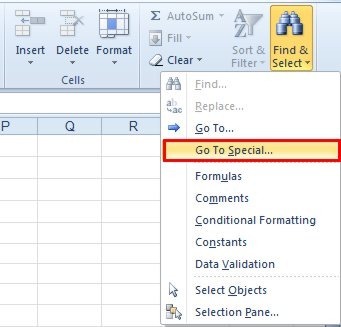 Below you can check out the video in order to understand how to use the Trace Precedents and Trace Dependents functions in Excel. Many times when Excel is used to manage lists of data, duplicates may exist in the lists of data and needed to be identified and deleted. 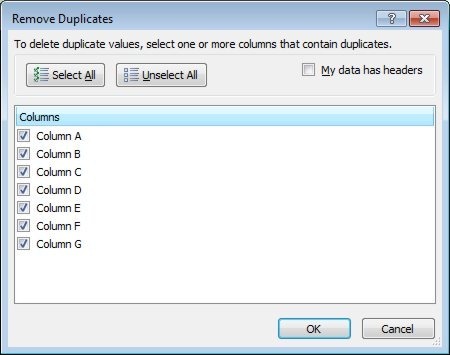 How can we identify the duplicates in our Excel spreadsheet? First of all, we must select a cell inside the area of the data and then activate the Data tab and from the area of the ribbon named Data Tools we select the command Remove Duplicates as we can see in the image below. Once selected the Remove Duplicates window appears as we can see in the image below. By default the My Data Has Headers command is activated, and all the headings of our spreadsheet are selected. If we do not have headers in our spreadsheet we need to de-activate the My Data Has Headers command, and the Remove Duplicates window will appear as the image below. If we want to uncheck all the headings we just press the Unselect All button. Then we click on the check box at the left of the column name that we want to check for duplicates. 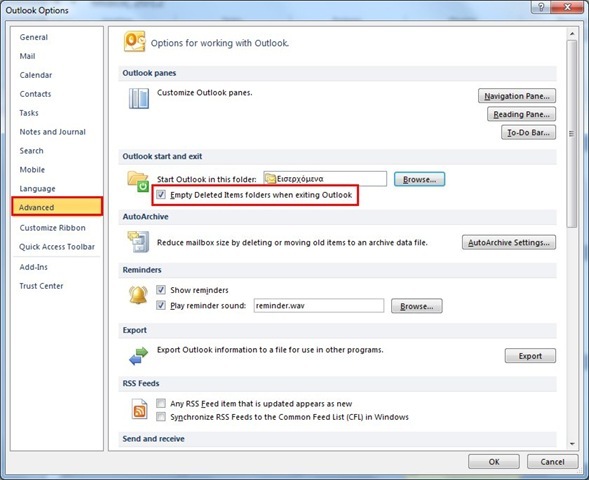 We then press the OK button in order for Excel to search and delete the duplicates. The information dialog box appears notifying us that one duplicate value was found and removed, and that six unique values remain as we can see in the image below. 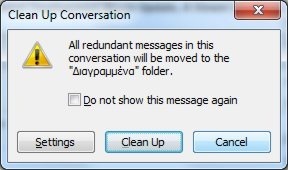 If we have selected a cell outside of the data area and try to use the Remove Duplicates function the following warning dialog box will appear notifying us that the command could not be completed because of the range specified. If we don’t want to remove the duplicates in our spreadsheet, but to highlight them in order to be examined we can use the Conditional Formatting command. In order to use it, we select the Home tab and from the area of the ribbon named Styles we select the command Conditional Formatting as we can see below. Once the drop down menu appears we select the Highlight Cells Rules and from the right of the menu we navigate to the bottom of the secondary menu and select the Duplicate Values command. 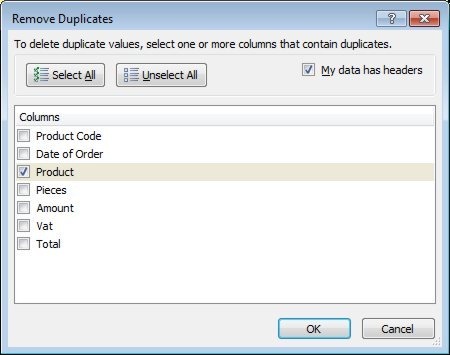 The Duplicate Values dialog box appears where we can select what sort of formatting the Duplicates or Unique values will have as we can see in the image below. Straight away our duplicate or unique values will be highlighted according to the format that we had chosen. 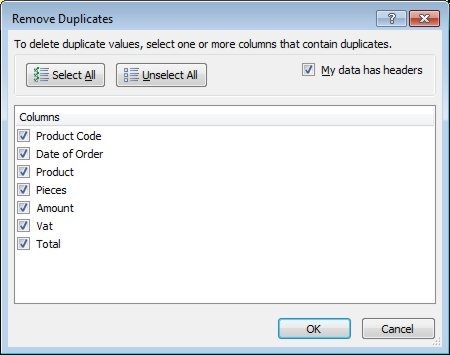 Below you can check out the video describing how to use the Remove Duplicates function in Excel 2010. We have just finished a formula in Excel (which we are proud of) but we want to make sure that what we did is correct. What do we do? 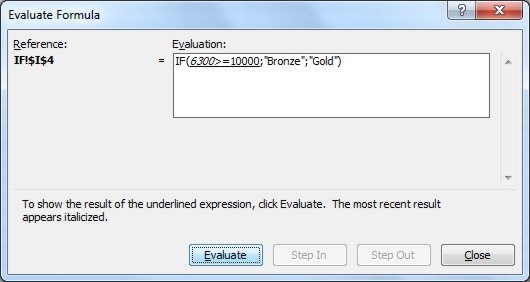 We can use Excel’s Evaluate Formula function. It helps us go through the steps that we used when we were creating the formula. Very useful function especially for long formulas and ones that have precedents, because it makes it very easy to see how Excel has calculated this formula. First of all we must select the cell that contains the formula and then select the Functions tab and then from the area of the ribbon named Formula Auditing we select the command Evaluate Formula as we can see in the image below. 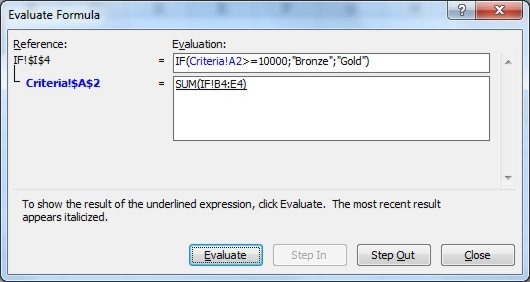 Once selected the Evaluate Formula dialog box appears as we can see in the image below. At the top left corner of the window and under Reference, we see the cells reference which is IF!$I$4 (the actual name of the sheet and the actual cell). In the Evaluation area of the Evaluate Formula window we see our formula. 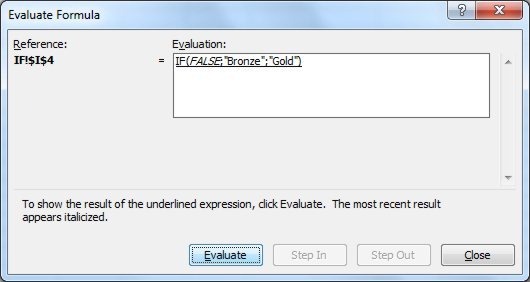 In this example the formula is =IF(Criteria!A2>=10000;“Bronze”; “Gold”). We notice that a part of the formula is underlined (Criteria!A2), so if we click the Evaluate button, we will see the actual value that the specific cell contains, as we can see in the following image. Now the part 6300>=10000 is underlined. If we click the Evaluate button, we will see the result of the first part of the formula. Seeing that it was an If function and the criteria 6300>=10000 is not True, the result that appears is False as we can see below. By pressing once more the Evaluate button the actual result of the formula appears as we can see. 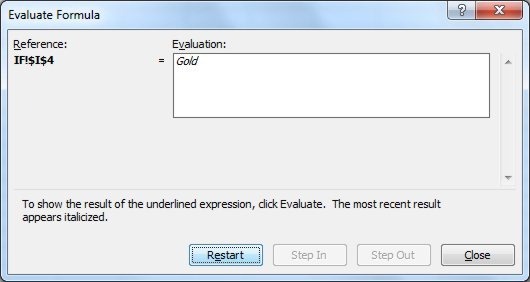 The Evaluate button changes to Restart in order to start evaluating the formula again. 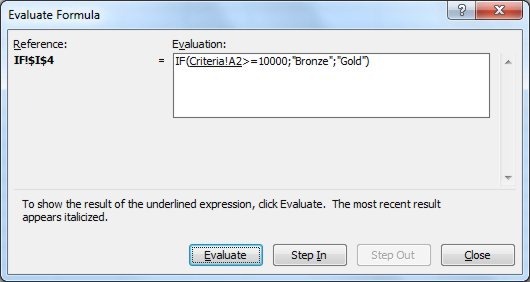 When we are evaluating a formula, we notice the Step In and Step Out buttons that appear on the Evaluate Formula dialog box. These buttons are enabled during the steps that have got to do with precedents as we can see in the image below. Here we see the actual sheet and cells reference Criteria!$A$2 that we have stepped in, and at the right we see the actual formula that the specific formula contains. Once we have checked it we can press the Step Out button in order to continue Evaluating the formula. 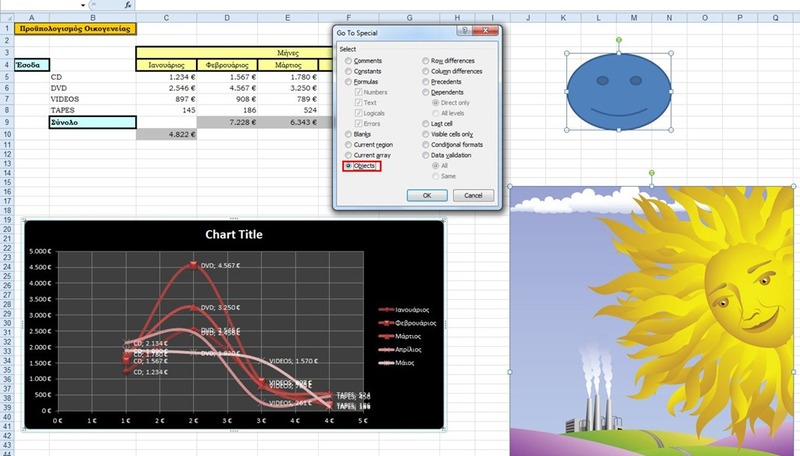 Below you can check out the video which describes how to use the Evaluate Formula in Excel 2010. 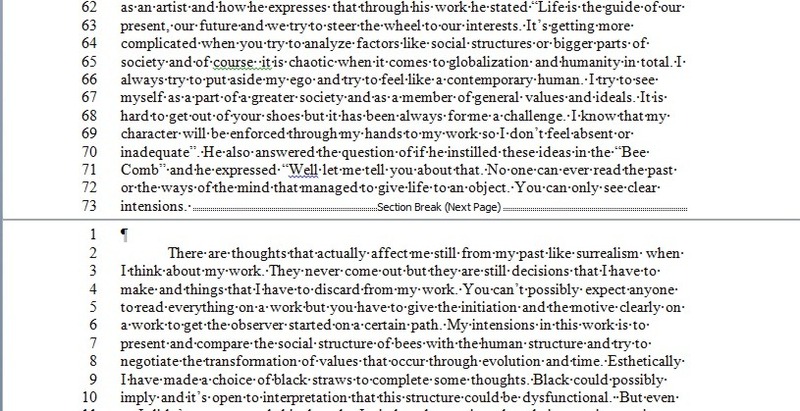 Templates are a special type of a document, where text, character, paragraph style and page formatting have been saved. All we have to do is to replace the text in the appropriate place holders. We create a Template the same way we create a document, but the difference is that we save it in a different way. This means that when we use it, we are not using the original Template but a copy of it. 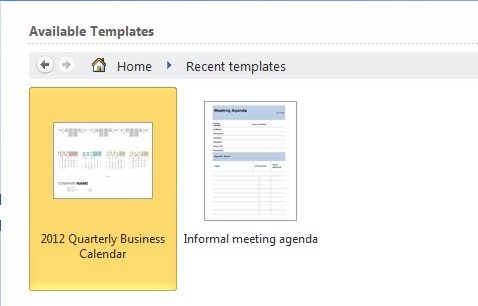 Templates are also available in Excel, Access and PowerPoint. 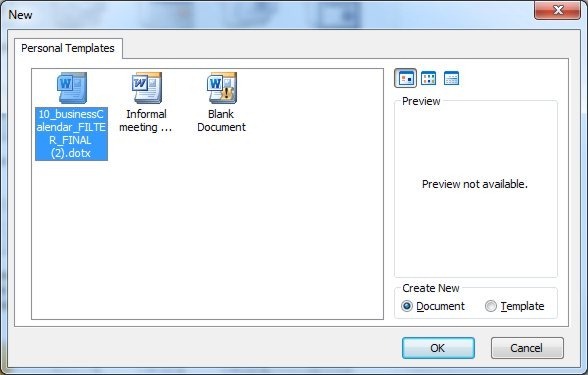 Below I will describe how we can create a New Document based on a Template available in Word 2010. The same procedure is followed with the other applications. We select the File tab in order to move to backstage view and from the drop down menu that appears we select the command New as we can see in the image below. By selecting this command a New Blank Document based on the Normal.dotx template is created. This means that we create a new blank document that has predefined type of font, predefined margins and so on. 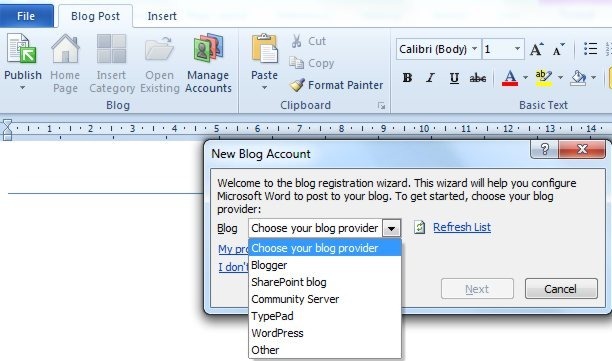 By selecting this command, a document is created where we can type in our text that we want to publish to a Blog Post. 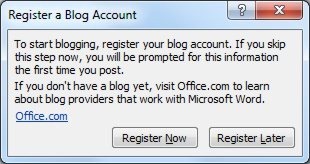 The first time that we will select this command the Register A Blog Account window appears as shown in the image below. If we select the Register Now button, the New Blog Account window will appear where we have to adjust all the parameters in order to publish our posts successfully. As we can see in the image below, even the ribbon has been adjusted in order to publish our post. By selecting the Recent Templates command, all the recent templates that we have used will appear below as shown in the image below. By selecting the Sample Templates, some representative samples of templates appear which we can use as shown in the image below. By selecting the My Templates command the New window appears where we can create a new document based on same of the available templates that appear as we can see below. 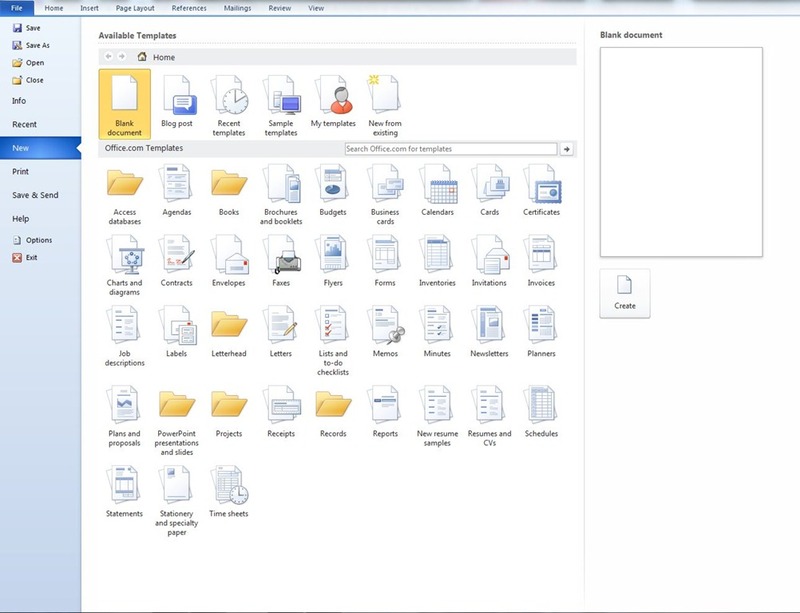 By selecting the command New From Existing, the New From Existing Document window appears, where we must navigate in order to locate the document that we want to base our new document. 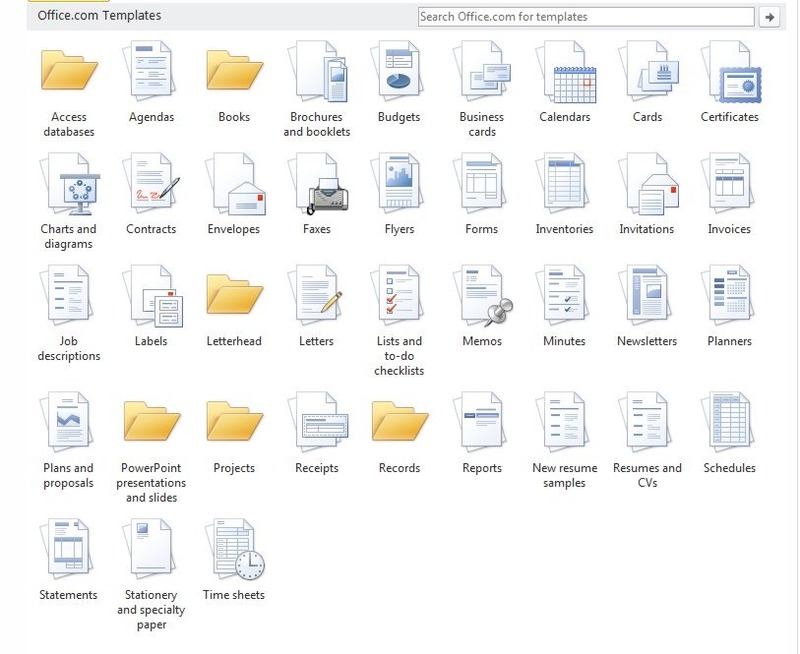 At the bottom of the drop down menu New and in the area named Office.com Templates we can see all the available categories of templates on the Microsoft Web site. 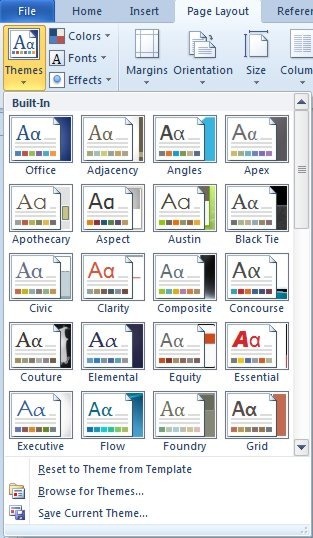 Every category of templates at the Microsoft Web site contains different subcategories. All we have to do is to select the appropriate one for us. 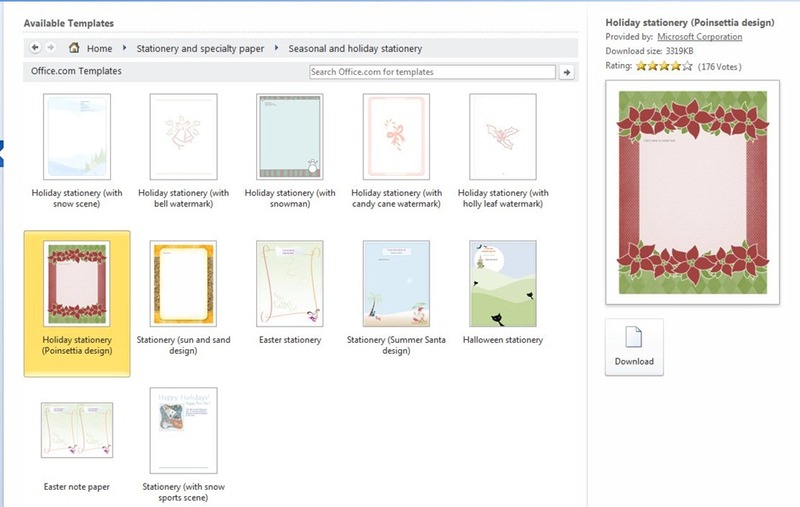 In the image below I have selected the category Stationary and then I have selected the Holiday Stationery. By selecting the template we can also preview it at the right of the screen. The preview shows us how it will appear in our document. It also notifies us of the Provider, the size of the file, and even what ratings it has. Once we have decided which template we want to use, below the preview area of the template is the Download button as we can see below. By selecting the Download button, the Downloading Template window appears notifying us of the process of downloading the template. Once it is completed it appears in a new document ready for editing as we can see in the image below. When we use a template, we are not using the actual template, but a copy of it. The original template remains intact whatever change we make on it. 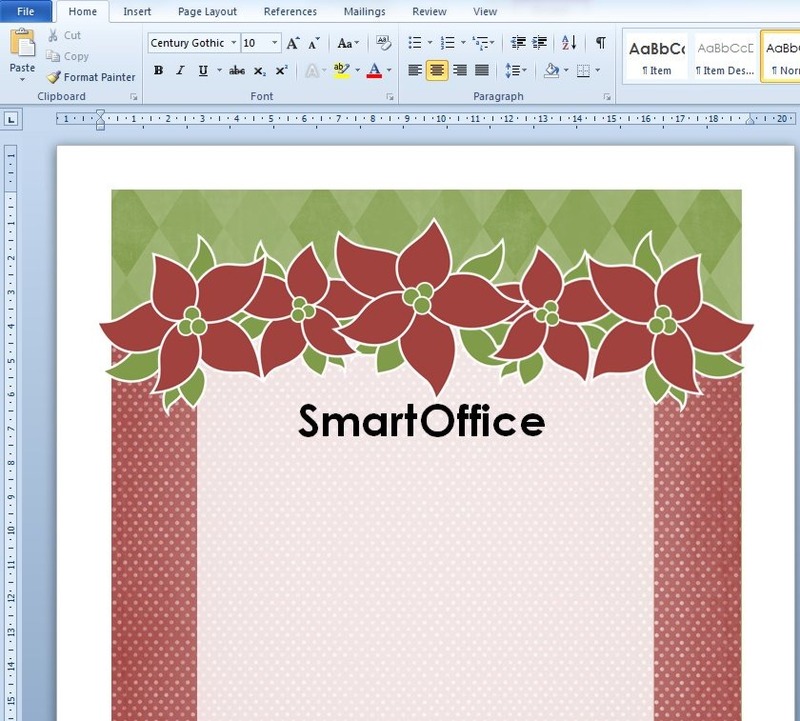 Below you can check out the video, on how to create a Template in Word 2010. By formatting our document, the headings the lists and other elements in the document is a time consuming procedure. With all the options that we have available, such as type of font, colors and the different graphic elements in order to present our document in the best possible way may seem exhausting. That is why a lot of users are satisfied with type of fonts such as Times New Roman and headings with font type Arial, just to be sure what they are doing. 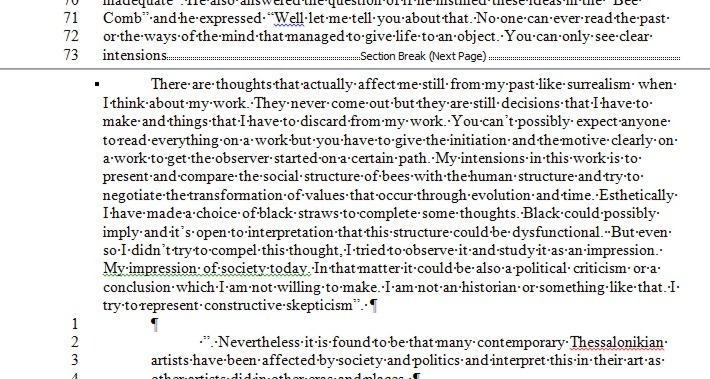 Thankfully, Word gives us the possibility to change the overall appearance of our document by applying a Theme. Themes are coordinate type of fonts, colors and designs that we apply to a document in order to give it a professional look. Themes have got to do with the appearance and the style of the document; on the other hand Templates have got to do with the content of the document. Templates contain styles, formatting, sometimes headers and footers and some text. All we have to do is to replace the text that is there with the text that we will type in. We create a template just like a document but we save it in a different way. That is because we never actually use the template but we use a copy of it actually. In my next post I will describe how to download and create custom Templates. In order for us to apply a Theme in our document we must select the Page Layout tab and then from the area of the ribbon named Themes to select the Themes as shown in the image below. Once the drop down menu appears with all the Themes we just move on top of each Theme with our mouse, and we have a live preview of what our document would look like. Once we have decided which Theme we want we just click on it. When we select a Theme we apply on our document color, font and effects on the elements of our document. 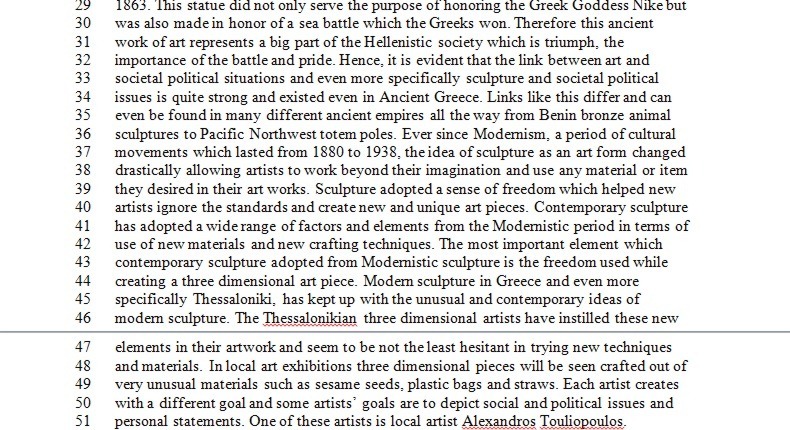 Colors: Each theme applies a set of colors in order to format the text foreground and background. 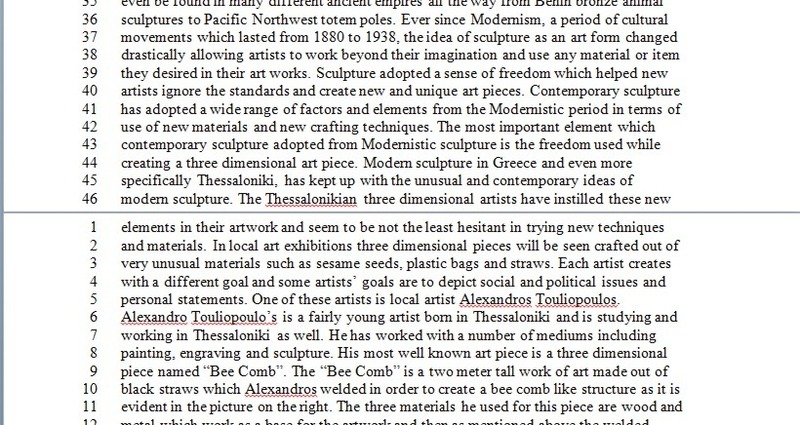 Other colors are applied for Headings Styles and other for hyperlinks. Fonts: Each Theme uses two fonts, one for the main body and one for the headings. Graphical Effects: Effects are applied to the graphics and other design elements in our document. 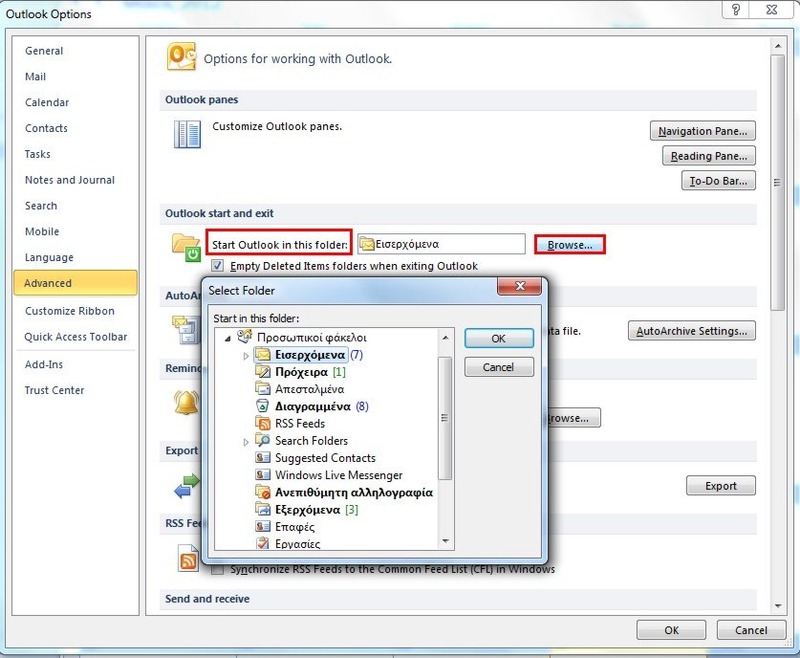 Themes can be applied in Excel, by activating the Page Layout tab, and in PowerPoint by activating the Design tab. Body Text: Font, Size, Style and Color. Headings: Font, Size, Style and Color. Tables: Font, Borders, Line Styles And Color. Charts: Font, Borders, Lines, Graphic Style and Color. Smart Art: Font, Graphic Color. 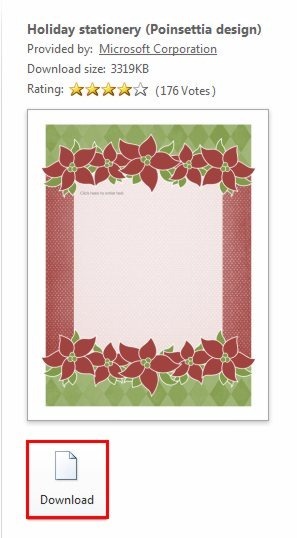 Clip Art: Border and Color of Border. WordArt: Color of Font, but the style remains the same. We can remove a theme that we have already applied by selecting this command. At the bottom of the drop down menu of the Theme command we also have the command Browse For Themes as shown in the image below. 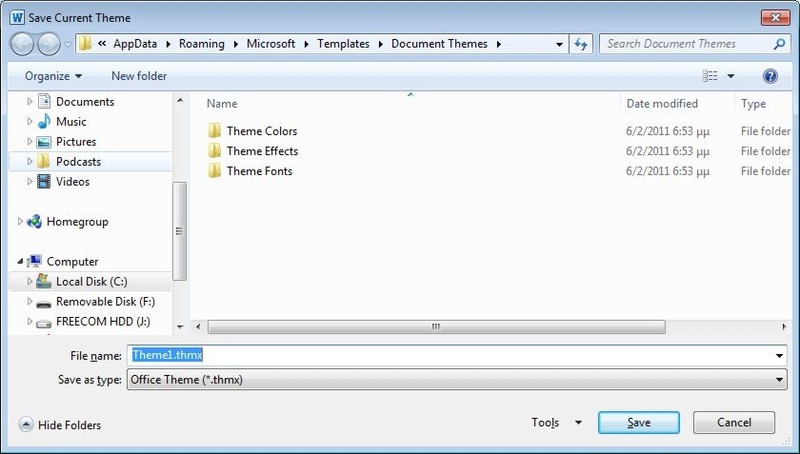 By selecting the command Browse For Themes the Choose Theme Or Themed Document dialog box appears where we must navigate in order to look for the Themes that we have saved or created on our computer. We then just select it and press the OK button. At the bottom of the drop down menu Themes, the command Save Current Theme is located. 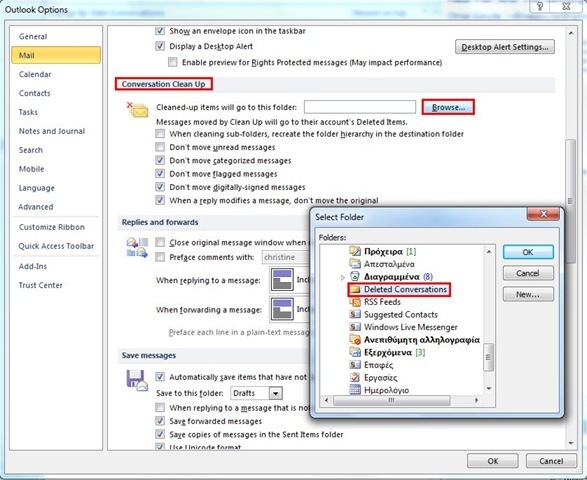 If we have formatted our document and we want to save it as a Theme, we just select the corresponding command in order to save it for further use. By selecting the command the Save Current Theme dialog box appears, with default folder location the Themes Folder, and all we have to do is to type in the name for our Theme, and then press the Save button. 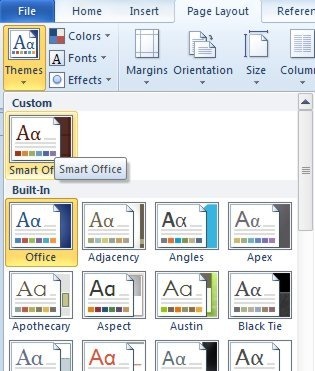 We notice that the extension of the file is .thmx, which stands for Office Themes. To apply a Theme that we had just saved, we must expand the drop down menu of the Themes command and from there to navigate to the category Custom as shown in the image below. 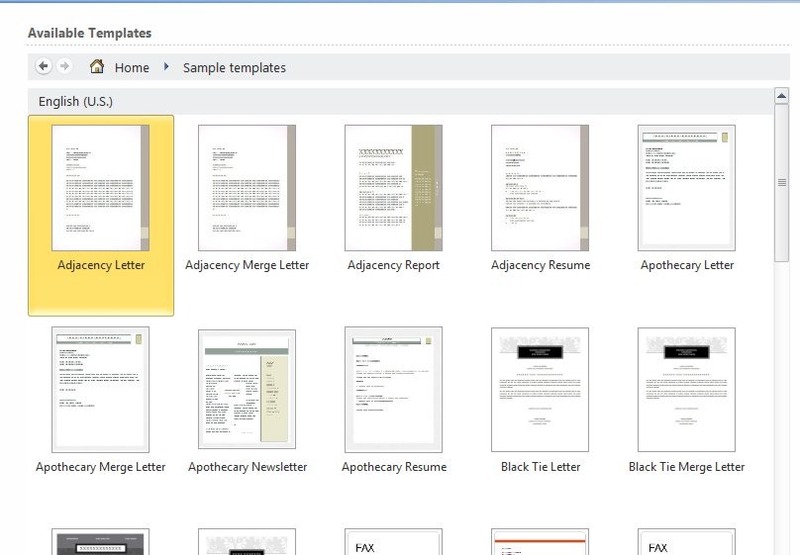 Below you can check out the video showing the steps in order to apply a Theme to a Word document.